Disabled people are being drafted in to help ensure websites are usable by all. The pool of disabled surfers has been brought together by the Usability Exchange, which aims to give instant feedback on website navigation. Website managers can use remote viewing software to watch how easily the surfers are able to move through a site as it is tested. 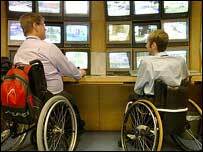 The service launches as new guidance is issued calling on websites to involve disabled people in the user-testing. The idea for the service came to Stefan Haselwimmer, also managing director of the Phone Anything website, in 2004, during talks with local authorities about access to their websites. "We were surprised by how few had tested their websites with disabled users," he said. "Most councils wanted to carry out disabled-user testing but didn't know how to get hold of disabled testers or how to conduct usability tests," Mr Haselwimmer explained. "At the same time, we knew lots of disabled people happy to test websites." Through the Usability Exchange, website operators will be able to create a variety of user tests and submit them to a range of users with different disabilities. Once tests have been submitted, website managers get feedback about how people fared on the tests and how easy the site was to use. They can also use remote-viewing software to watch how users get on as they navigate around a site. All the testers for the Usability Exchange are paid for their time. The launch of the Usability Exchange comes as the British Standards Institution and the Disability Rights Commission issue a new set of guidelines that recommend website creators involve disabled people in testing. Julie Howell, policy development manager at the RNIB, said: "Research published by the Disability Rights Commission in 2004 showed that testing with disabled users may uncover 45% more accessibility problems than testing with software alone." Although she welcomed the arrival of the service, Ms Howell said she had a couple of concerns. Firstly, she said Usability Exchange had to demonstrate the quality of the testing work being done. "It's one thing to put businesses in touch with disabled people," she said, "but what's the quality of the process involved here?" The company would have to work hard to ensure the information fed back to clients was useful. "That does not mean making it all positive but making it all honest," said Ms Howell. The last thing any business would want was to test with Usability Exchange and then find that disabled people cannot use their website. 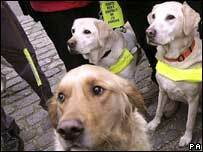 Ms Howell said she also had worries about the well-being of the disabled testers employed by Usability Exchange. She urged those taking part to let the government know they were taking on employed work. Already the Royal Mail, Orange, Fortune-Cookie, Adult Dyslexia Organisation, Scottish Parliament, Wandsworth Council and Leicestershire Council have submitted their sites to the exchange for testing. The Disability Rights Commission also plans to start evaluating the Usability Exchange service from April 2006.